There is a tradition in my family: before someone (namely, me) gets on a transatlantic flight, we always pop in to Linh Son in Federal Way for a steaming bowl of rare beef pho. It's not fancy; the entrance is lined with fake, green plants and the vinyl booths squeak as you squeeze in by the windows lit by Linh Son's neon sign, serenaded by old, Vietnamese pop songs. If anything, it's tacky. But it's damn good. And we've been going for years, frequenting the restaurant at least 3-4 times a month. It's also dirt cheap. Pho is available in two sizes: medium and large. We order the same thing, every time. When someone deviates from their usual, eyebrows are raised, but nothing is said. "Two number 2As, three number eight mediums and one number seven medium," my dad rattles off to the waitress before we've had a chance to slide our butts into the vinyl booth. To this day, I have no idea what the dishes we've just ordered are called. All I know is that the summer rolls are plump, filled to bursting point with vermicelli noodles, thin slices of char siu pork, tiger prawns and a delicious peanut sauce. To me, pho is comfort food - a lot like chicken noodle soup. Any anxieties I have before getting on a plane and saying those painful goodbyes to my family are quelled by the delicious, steaming hot bowl of soup noodles in front of me. On the other days we visit the restaurant, I look forward to hopping straight back into the car and heading for a short shopping trip at the Supermall or Trader Joe's before they close. So when meeting Tom and Cristy at Banh Mi Bay in Holborn for dinner, I knew I had to try their pho as a sort of taste test (it passed). 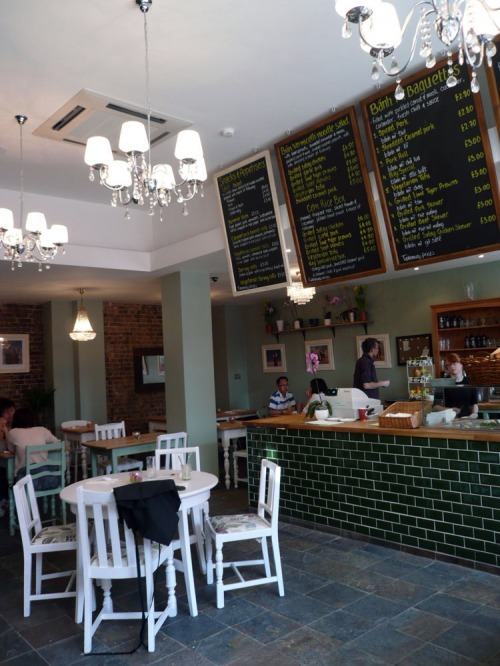 The interior of Banh Mi Bay is everything that Linh Son isn't: chic, trendy, bright and friendly, you might mistake it for a posh cafe or deli in Notting Hill. They offer a delicious selection of fruit smoothies and a childhood favorite of mine, cold chrysanthemum tea. To start, we had two orders of summer rolls (one veggie and one meat) and the pork meatball wraps. Although only half the size of the summer rolls from Linh Son, it's clear that Banh Mi Bay focuses on quality, not quantity: the rolls were stuffed with fresh ingredients and tasted just like a spring (or rather, summer) day. I could have done with a bit more meat/prawns, however, rather than the vermicelli rice noodles. The accompanying sauce was also a perfect complement - not too sickly sweet, as some Vietnamese restaurants serve. The pork meatballs were delightfully fun, as you were presented with mint leaves, grated carrots and vermicelli noodles to make your own wraps. When it came time to order our main courses, Tom had the utterly yummy Banh Mi (which is made on a freshly baked baguette) while John and Cristy opted for large, delicious bowls of Bun Thit Nuong. As for my pho, well, it was heartwarming and tasty - everything I could have hoped for. It stirred up quite a lot of nostalgia for the Vietnamese cuisine I grew up with in the Seattle/Tacoma area and reminded me of home. I was slightly disappointed to find a wedge of lemon nestled in my beansprouts rather than lime and I think the broth could have used slightly more coriander, but other than that, I had no complaints. And to top it off, the presence of one of my favorite hot sauces, Sriracha, on the table gave the restaurant real credibility. At the end of the evening, our £33 (for four people) bill only made the meal all the more enjoyable. I wish I had discovered Banh Mi Bay earlier to satisfy my pangs of longing for pho, but I predict I'll now be a regular visitor. i would like you to know that i totally want pho right now. yes, at 8am. ;) mmm so good. rhea, it's NEVER a bad time for a big bowl of pho. there's nothing wrong with eating soup noodles for breakfast anyway - it's one of my favorite things to do in hong kong.